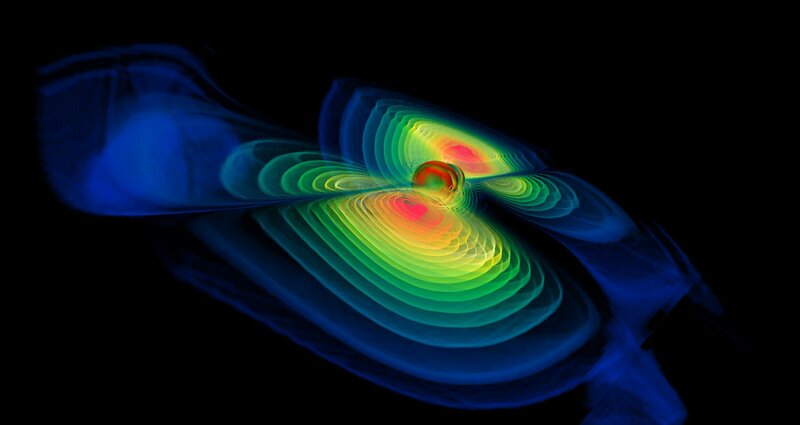 Today researchers announced that they have detected ripples in the fabric of space called gravitational waves. It’s a groundbreaking discovery that has eluded Earth’s brightest minds and most sensitive machines for decades. “Finally these waves have been detected on Earth with an unbelievably sensitive experiment. And, surprisingly, the source of the waves is a system of two black holes in orbit around each other, that spiral inward and smash together,” Cornell physics and astrophysics professorSaul Teukolsky confirmed in a statement emailed to Tech Insider. “We’ll open new doors which can never be closed again,” he said. The discovery not only vindicates Einstein’s wildest prediction and gives astronomers a powerful new tool to probe the cosmos — from deep inside exploding stars to the surfaces of black holes — but also backs up a $1 billion idea and tells us we’re on the right track to understanding how the universe works. NASAAn artist’s depiction of two neutron stars colliding and rippling spacetime with gravitational waves. Space is pervaded by, well, space. It’s an invisible fabric that can stretch and shrink and warp and curve in multiple dimensions, even time — hence the official name spacetime. This description of gravitational waves was pure conjecture, though, until 1974. That’s when astronomers Russell Hulse and Joseph Taylor stumbled upon the deep-space equivalent of two speedboats spiraling into each other. Both objects were neutron stars — ultra-dense dead stars that formed during a supernova. (The star collapses but is not big enough to form a black hole). One of the neutron stars was spinning fast enough to emit radio pulses as a pulsar, which is how they found the star system to begin with. Surprisingly, over the years they noticed the pulsar’s orbit was hastening, bit by bit, and deduced the stars would spiral into each other and collide in about 300 million years. “That orbital energy had to be going somewhere,” physicist Imre Bartos, also at Columbia University and LIGO, told Tech Insider. By disturbing spacetime so much during their deadly cosmic dance, he said, the stars had to bleed off the energy as gravitational waves. Hulse and Taylor proved this by showing the energy loss matched up perfectly with Einstein’s predictions. Courtesy LIGO LaboratoryThe device that splits LIGO’s laser into two beams. Makra compared the detectors to a pair of giant ears that can “hear” the spacetime ripples that result from neutron star collisions, black hole mergers, or other catastrophic events in space, like a giant exploding star. The closer a collision is to Earth, the “louder” the signal should be. LIGO’s hearing — when the laser beam is disturbed — is sensitive enough to detect mind-blowingly small disturbances of space, “much smaller than the size of the atoms the detector is built of,” he said. Put another way, detecting a gravitational wave is like noticing the Milky Way — which is about 100,000 light-years wide — has stretched or shrunk by the width of a pencil eraser. So it’s no wonder why it has taken researchers so long to find gravitational waves: it’s terribly tricky work. Even car traffic on a road miles away can disturb LIGO, despite the instruments’ state-of-the-art vibration-dampening equipment. But today’s announcement proves the concept really works. NASAIllustration of a star exploding as a supernova. One killer application of gravitational waves is to reveal supernovas — huge, exploding stars that seed the universe with elements like carbon, nitrogen, and oxygen as well as platinum and gold — hours before they’re visible to any telescope. So if a gravitational wave’s source lights up some detectors, it might be from a supernova — giving astronomers plenty of notice to point telescopes like Hubble in that direction, hit record, and get an unprecedented look at processes that are the reason Earth and life exist at all. NASAEta Carinae, a star that went supernova around 1837. Bartos says the other advantage is that gravitational waves can reveal what’s going on inside a dying star. “Right now the only tools to explore what happens inside are computer models,” he added. Dana Berry, SkyWorks Digital, Inc.An illustration of two neutron stars colliding. “LIGO will be three times more sensitive in three years, and we roughly expect to see 10s of events per year,” Bartos said. That sensitivity could get even higher soon. LIGO wants to build a third instrument, but in the meantime it will get help from Europe’s new VIRGO detector (opening in late 2016) and Japan’s KAGRA facility (going online in 2017). “The more [detectors] you have, the better your sensitivity, and the more stuff you will see,” Bartos said. “It becomes easier to weed out the things that happen here on Earth, like traffic and earthquakes” and find and pinpoint a signal. The future for gravitational-wave astronomy is looking very bright, and the top researchers behind LIGO — possibly Kip Thorne and Ronald Drever of Caltech, and Rainer Weiss of MIT — are almost certainly going to get a call from Stockholm sometime soon. It’s always helpful to read articles from other writers and use a little something from their web sites. up. The text within your post are most often running from the screen in Firefox. with browser compatibility nevertheless i figured I’d post to let you know. up. The text inside your content are running off of the screen in Chrome. that i figured I’d post to inform you. The layout look wonderful though! now I am just using net for articles, due to web.